Deep and complex, rich and luxurious. 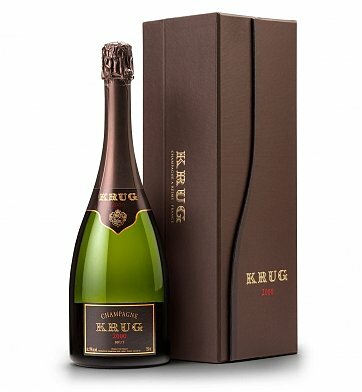 Rated 96 Points by Wine & Spirits, the 2000 Krug Brut Champagne is an expressive combination of citrus, hazelnut, caramel and nougat, perfect for pairing with fruit desserts or caramelized scallops. Very high aging potential. The House of Krug uses traditional methods of fermenting its Champagne the old fashioned way in small oak casks to achieve an intense bouquet and complex flavor. Vintage Krug Brut Champagne is a hand delivered gift. These gifts are delivered by one of our local design centers located throughout the United States and Canada. Same day delivery is available for most gifts when ordered before the cutoff time. The cutoff time for Vintage Krug Brut Champagne is 2 PM in the recipient's time zone. World-famous Champagne from the House of Krug. Notes of citrus fruit, toasted nuts & caramel. A signature Krug gift box.